Final Fantasy XIII To Cost $89 In Japan? That red kiosk is called "Loppi". It's located in Japanese convenience store Lawson. 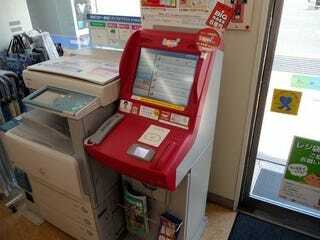 It's a ticket selling machine, but customers can also go shopping and even pre-order video games and consoles. The Loppi screen lists the Xbox 360, the PSP 2000 1seg tuner and right below that? Final Fantasy XIII. The game is priced at ¥8,240 (US$88.99) and pre-orders start September 9 at 10:00AM. For comparison's sake, Tales of Vesperia for the PS3 is priced at ¥7,800 and Bayonetta is priced at ¥7,980. Square Enix has announced that FFXIII is out "This Winter".